Political, economic or environmental developments halfway around the world can have significant ramifications for oil and gas companies, affecting investment, pricing, and management strategies. This is the nature of a rapidly changing global economy. 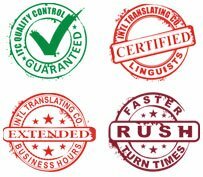 As a result, operators in the oil and gas industry need translation service providers who can deliver quick, accurate, and precise translations. Energy markets have been completely internationalized, and it is essential for oil and gas companies to communicate effectively with their foreign subsidiaries on a day-to-day, minute-to-minute basis.